Quinn Bellandini and her sister, Delilah run their family B&B in Savannah, GA, with the help of their semi-retired grandfather. Both in their thirties, they are happily living in the charming Southern city of their birth. Quinn's world is turned upside down, however, when an old neighbor and classmate moves back to town. Quinn has held on to a grudge against Tucker since their high school days and is not happy to see him return. Sister Delilah thinks they are a perfect match and wants to play matchmaker. Another friend of Quinn's, Drew, owns a neighboring restaurant with his brother, Jason. When Quinn stops by the restaurant late one evening to clear up a misunderstanding, she finds Jason dead on the kitchen floor with a knife in his back, life gets complicated. The restaurant is in trouble and has been a bone of contention between the brothers. Drew is the logical suspect, and as the person who found the body, Quinn is a person of interest, too. Quinn is a loyal friend but a reluctant sleuth, and she springs into action. 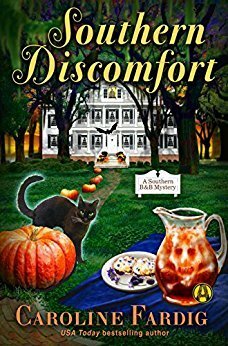 Southern Discomfort is a promising beginning to a new cozy series for Caroline Fardig. I would have liked more background to Quinn's friendship with Drew. Even though she was a person of interest and was warned off by the police, she was willing to put herself in danger for him. There wasn't much mystery as to the killer even for a sleuth as inept as Quinn, even with a little help from the family ghost and Delilah. I enjoyed the characters and setting and look forward to the next in the series. I hope that we see more of Delilah in future books. Thanks to Net Galley and Alibi for an advance copy. The opinions are my own.